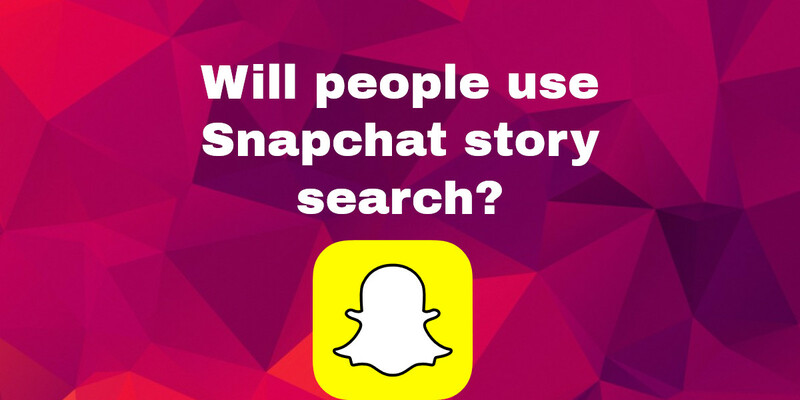 Will People Use Snapchat Story Search? Home → Social Media → Will People Use Snapchat Story Search? Mere moments ago, I discovered the Snapchat story search. An interesting new feature that Snapchat has launched to help navigate its extremely popular Snapstory feature since millions of snapstories are posted every single day. And after my first encounter, I must say that people should use Snapchat’s search feature and I have to wonder why I have not before. Open Snapchat. At the top of the screen there is a search bar, when you click on it one is first met with the “Top Stories” from around the entire world and then stories near where one is located. For example, I can see stories people have posted from the university near my house. If you still don’t see what you are looking for, you can search for keywords. I naturally searched “puppies” and was met with the most delightful video of six newborn puppies crawling around. I went through more stories and found people at the People’s Climate March in Washington D.C., Montpelier, and Denver, graduating college around the United States, and watching the White Sox versus Tigers game in Detroit. I wish I had been able to attend the Climate March so now I am able to view it from my home for free, which is really nice. I think Snapstory search is a great way to be able to see things that you would not be able to in real life. I think I could definitely spend a long time looking through videos of animals when I am bored as a way to pass the time. I am just disappointed that I did not know about it sooner. The Snapstory search could also be used to connect with other Snapchat users. If two people are at one event and did not know it, they could possibly find each other through snapstories. Or people could connect through shared interests, such as a sporting event or find new things to do near them such as going to new restaurant. This could help businesses by attracting more customers over snapchat and Snapchat could attract new users who want to see different events around the world. Users that already have Snapchat could post stories in the hopes that more people see it than just their Snapchat friends. With all of its potential, I feel like this feature has gone wildly unnoticed so far. This could be because it is not as obvious as regular snapstories that have their own page on the app, and Snapstory search has not been as advertised on other social media apps. Perhaps Snapchat should make the search feature a bit more obvious so people can take full advantage of it. There are so many different uses for the Snapchat story search that can add to the enjoyment of Snapchat. I am a student at Central Carolina Community College working towards an MBA. I write about social media, marketing and create content for the web.